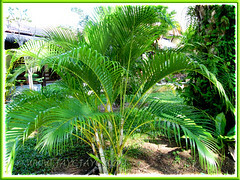 A small to medium-sized clustering palm tree that is widely cultivated as an ornamental plant worldwide, especially in the tropical and sub-tropical climate. 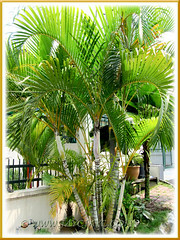 Dypsis lutescens is popularly sought after by home gardeners, interiorscapers and landscapers alike, not only for its ease of growth but mostly for its aesthetic beauty of elegance and grace. Versatile and hardy, these Yellow Butterfly Palms with long and arching fronds that sway gracefully with the wind and breeze, can be grown as indoor potted plants or ground-grown outdoors in the full sun. 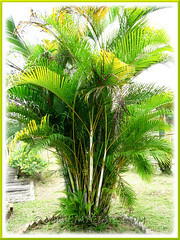 An interesting and colourful tropical palm where the fronds may change colour due to the intensity of light received and according to the age of the leaves. Hence, it’s normal to see its foliage in varying colours besides the usual green. 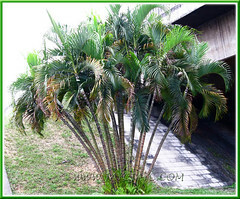 Features: Dypsis lutescens, a species of the large genus, Dypsis which consists of about 160 species of palms, is a clustering palm with moderate to fast growth rate. 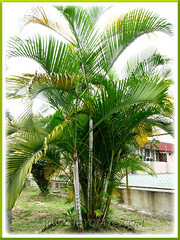 An evergreen, multi-trunked perennial palm that can scale up to 20 ft (6 m) tall or more, though typically seen around half that height, and has a crown spread between 8-13 ft (2.5-4 m). 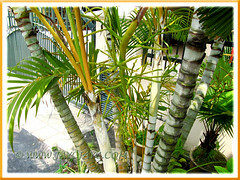 A mature Golden Yellow Palm will sucker prolifically and eventually form dense clumps of about a dozen or more trunks or stems, each 2-3 inches (5-7.6 cm) in diameter. As the palm matures to its true height, it becomes top-heavy as older fronds are shed. The stiff and upright trunks with colours ranging from orange, yellow to brown or silver-green, grey to dark green will be distinctly ringed by leaf scars, similar to bamboo canes, hence the many common names assigned. Crowning above the attractive trunks are the yellowish-green to dark green feathery fronds, 6-8 ft (1.8-2.4 m) long that gracefully and beautifully arch outward and downward, butterfly-like. The 2 ft (0.6 m) long, slender and lance-shaped leaflets are pinnately arranged on light green to yellow or golden coloured petioles, creating a lovely ‘V’ shape. The crownshafts are whitish-green or lemon-coloured, at the base of which a branched inflorescence will emerge and hang loosely downwards as seen in the left image. It is monoecious with inconspicuous male and female yellow flowers borne on the same tree, that eventually develop into small oval-shaped fruits, 1 inch (2.5 cm) in diameter, turning from yellow to purplish-black when ripe. 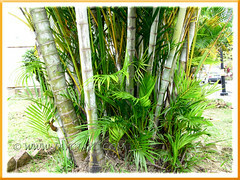 Culture (Care): Dypsis lutescens is noted for its ease of growth and low maintenance. Light: Grow in full sun or shade but best in bright filtered light. Moisture: Moderate to heavy water requirements, especially during hot seasons. It enjoys a humid condition. Hence, an occasional shower or misting will make it happier and healthier. Soil: Prefers moist, fertile and well-drained soils, though tolerant and adaptable to a wide variety of soil types. 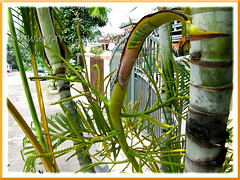 Others: The Yellow Butterfly Palm suckers prolifically. You can use the suckers or offsets to start new plants or let them be, to grow naturally and provide a screen or hedge for some privacy. Otherwise, remove the offsets to allow the plant to mature unhindered and to showcase its attractive trunks and graceful fronds. Remove withered or discoloured fronds, and even lower fronds if necessary to maintain tidiness. Feed once monthly with a balanced liquid fertilizer. It is susceptible to nutrient deficiencies, such as potassium and magnesium, which causes chlorosis of older leaves (learn more on nutrient deficiency symptoms in plants). Generally disease and pest free except occasional attack from spider mite, mealybugs and scale insects. For subtropical and temperate regions: Hardiness: USDA Zone 10-11. Cold tolerance down to 34°F (1°C). It is frost sensitive and must be protected during freezing temperatures. In non-hardy regions, it is recommended to grow these palms as indoor plants or in containers to easily overwinter indoors. Provide adequate bright indirect light, warmth and humidity for optimum growth. Requires more water during the growing seasons, especially hot summers but reduce water during winter. Propagate in spring. Propagation: From fresh, overripe seeds that take about 3 months to germinate. An easier and faster method is by removing the offsets or suckers from the base and grow as new plants. Alternatively, you can divide the young clumps and grow each division separately. 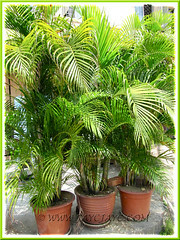 Usage: D. lutescens or Areca Palm will make excellent specimen plant, outdoors or indoors. Its clustering and suckering growth habit make it most ideal to be used as hedge or screen, or simply as a captivating landscape plant or focal point for added interest and beauty. They’re popularly used for landscaping along the roadsides, road shoulders/dividers, roundabouts, highways and byways by town and city planners. Suitable as container plant for patio, deck, poolside and the like for that tropical and breezy appearance. 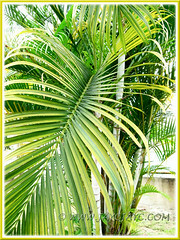 Golden Feather/Cane Palm is also favoured by interiorscapers as indoor plant in containers or above-ground planters for shopping malls, building lobbies, offices, restaurants, etc. Some of my neighbours are growing it as a privacy wall. These shrubby-looking palms will definitely serve that purpose well. Thanks for dropping by, A. Belle!